Former President George H.W. 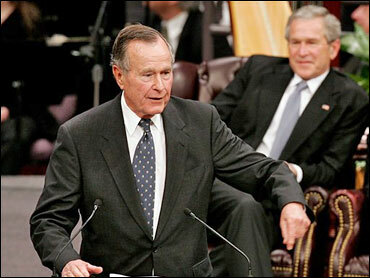 Bush has expressed dismay and anger at attacks on his son, President Bush, at the funeral for Coretta Scott King. "In terms of the political shots at the president who was sitting there with his wife, I didn't like it and I thought it was kind of ugly frankly," the former president said in an exclusive radio interview with CBS News White House correspondent Peter Maer. "Anybody that shoots at the president of the United States at a funeral, I just didn't appreciate that," Mr. Bush added. Former President Carter and the Rev. Joseph Lowery criticized the president during remarks they made at the King funeral in Atlanta. The Rev. Lowery, who co-founded the Southern Christian Leadership Conference with Martin Luther King Jr., drew a roaring standing ovation when he said: "For war, billions more, but no more for the poor" - a takeoff on a line from a Stevie Wonder song. The comment drew head shakes from Mr. Bush and his father as theysat behind the pulpit. Former President Carter brought up the government response to Katrina, saying, "We only have to recall the color of the faces of those in Louisiana, Alabama and Mississippi" to know that inequality exists. He also noted that the Kings once were "victims of secret government wiretapping" - echoing Mr. Bush's domestic spying program. Former President Bush also had praise for his friend, Bill Clinton: "I thought President Clinton was maybe the best. It was his crowd. They talk about Bill Clinton being 'the first black president,' well when you walk into that church with 12,000 or whatever it was, I mean it was very clear who that crowd loved and respected."